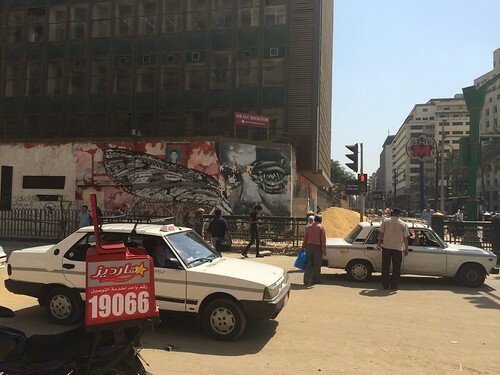 Thursday afternoon, many people were surprised to find out that there were municipal workers demolishing the famous graffiti American University in Cairo “AUC” wall in the famous Mohamed Mahmoud wall. 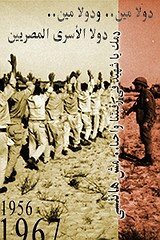 I headed there and I asked them what was going on and workers who were puzzled on why young people were photographing them told me that it was by the orders of Cairo governorate. Working and breaking down the wall on Thursday. 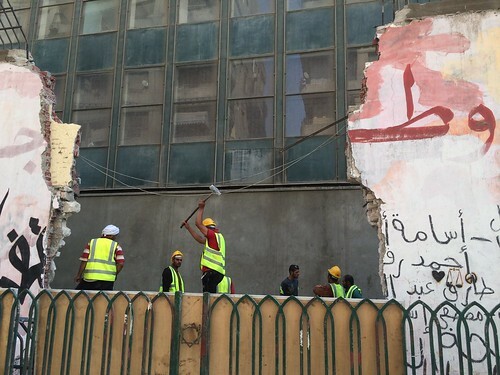 According to the AUC media office, the University decided to demolish its Science building in the AUC Tahrir campus Mohamed Mahmoud street as part of the Tahrir renovation plan of Cairo governorate. The AUC science building will be replaced by a garden accordingly as it has not been used since the AUC campus was transferred to New Cairo. 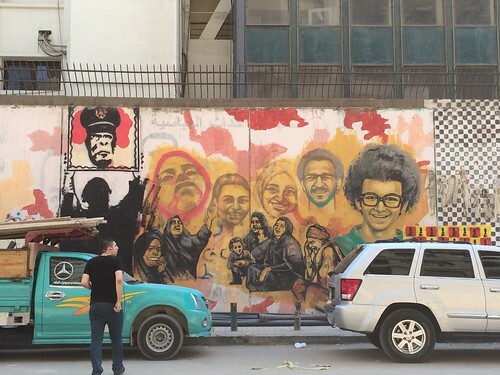 The Tahrir AUC Campus already is turned into a cultural hub. It turned out that this plan was announced last month and nobody paid attention to. 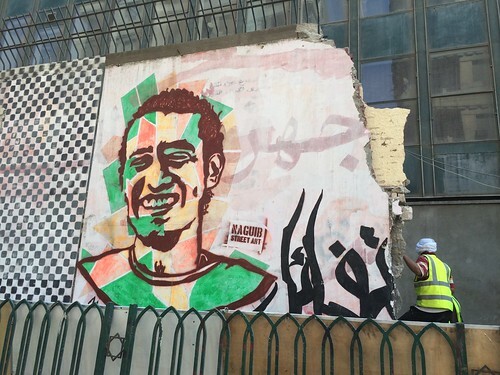 Now there are conflicting reports about the fate of the famous Graffiti AUC graffiti wall. 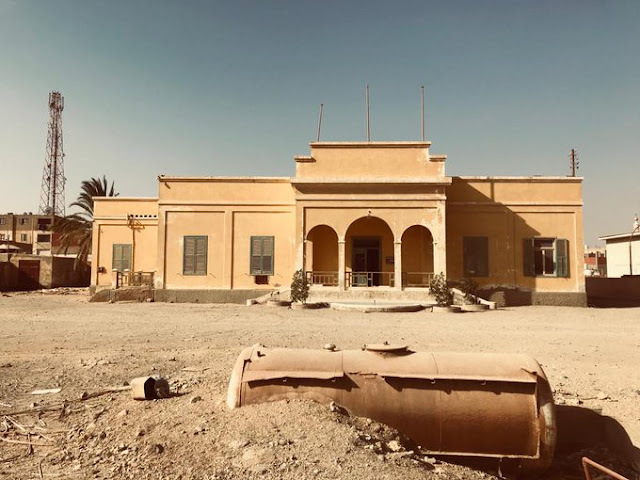 The media center in the AUC says that it will be completely demolished and replaced by a fence while the AUC professors say that the wall will be kept and that part demolished will be turned into a gate. 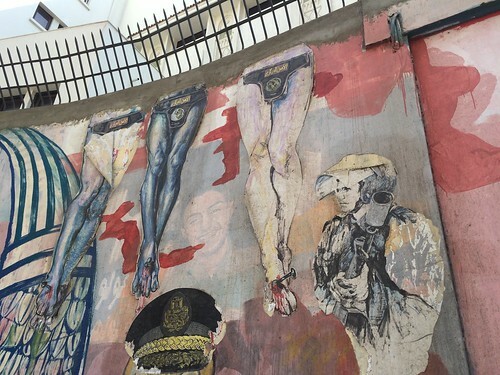 When it comes to the graffiti, the AUC said that it documented all the phases of the graffiti painted on the wall in photos which will be used in exhibitions later. Personally I have a suggestion, instead of demolishing graffiti wall , the AUC can split the wall into graffiti murals and transfer them to other places or put them in that garden they are planning like what happened with Berlin Walls. 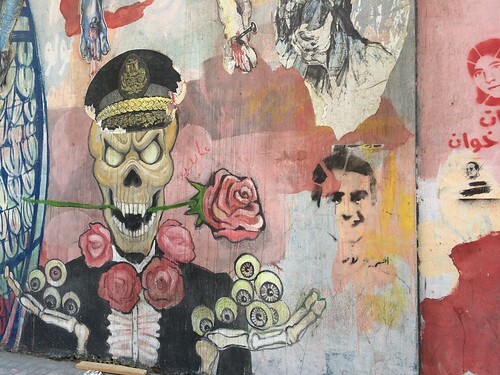 Anyhow , this is like an end for the graffiti era in Mohamed Mahmoud street because after all despite there are graffiti paintings and murals all over the street yet the most famous are the AUC walls part , which looks over Tahrir square. Now most of the famous young graffiti artists in Egypt have left Egypt. 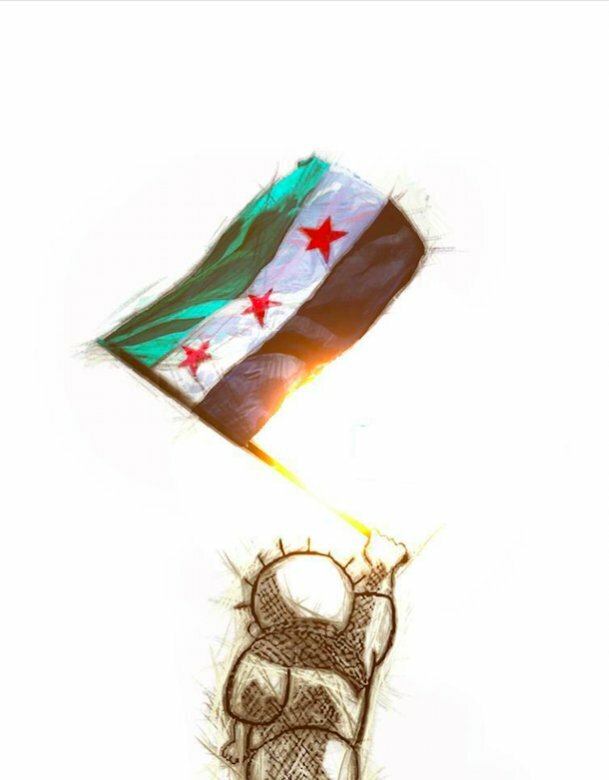 I think painting anti-regime graffiti murals now can be a criminal act according to the law if I am not mistaken recently. 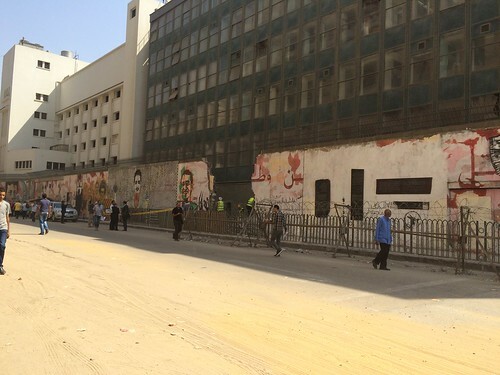 I do not think that graffiti slamming the Ministry of interior will be welcomed. 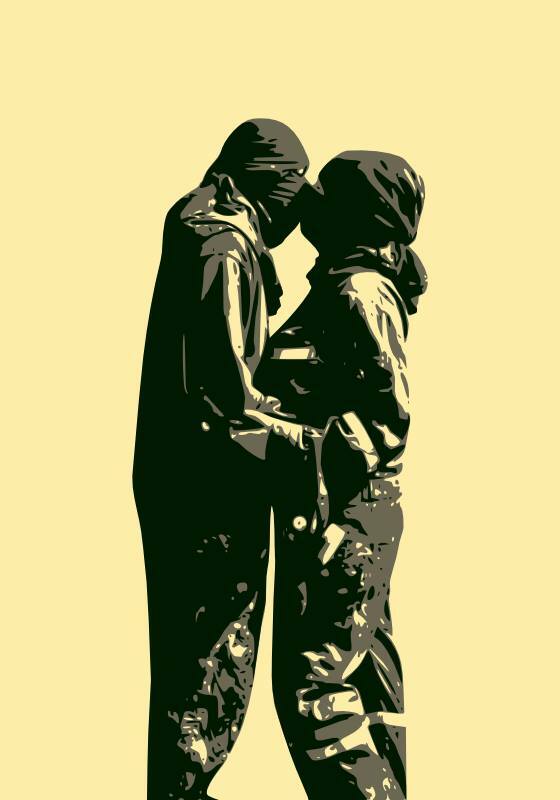 By the way speaking about graffiti, I can’t ignore the fact there are Arab graffiti artists featured in Banksy’s Dismaland including Egyptian graffiti artist El-Teneen. 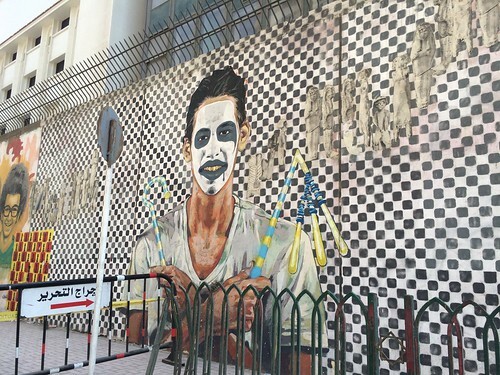 This is the graffiti painting of El-Teneen in the not-so-usual amusement park. 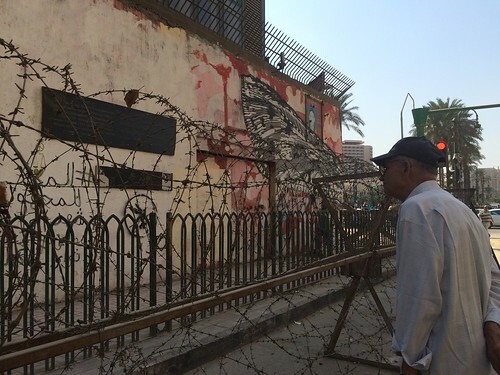 El-Teneen already got a painting currently on the Mohamed Mahmoud AUC graffiti wall. 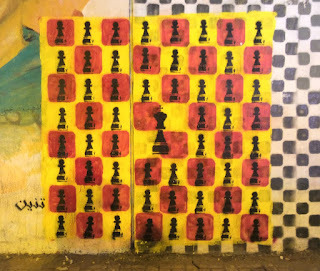 The king and his pawns "El-Teneen"
Of course, I will seize this opportunity to post my Graffiti photo album as usual. serving several jail sentences including illegal protesting": it's not Ahmed Douma, his name was Mohamed Sami and he died for illness a couple of years ago. 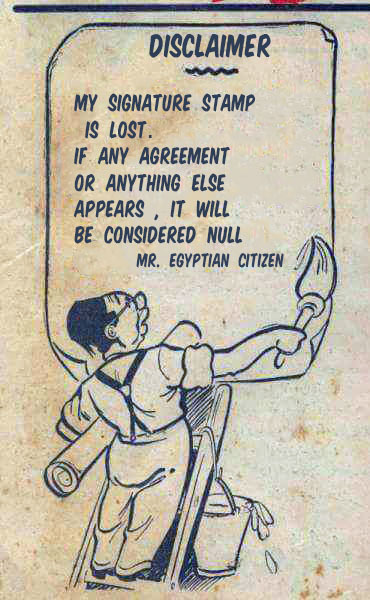 Thanks Naguib for the artwork and correction. I would say that Doma shares the same smile of late Sami God bless his soul. Booo! The Revolution in 2011 is now just a memory for many who fought so hard for change. Change comes very slowly, probably not in my generation either, except for the bad stuff. Just in my opinion, as an older U.S. citizen. Sometimes it just all seems so hopeless, but the hope if any always lay with the young people. They will eventually be successful, just as their short window of time, this time around was. We visited in 2010 October, then again in Spring 2011, to say "congratulations". We were the 1st group allowed back in as a tour to the Alexandria Museum, where we were greeted with news photo on their next news and Roses for the ladies. Everyone was so happy then. That was "then", and this is now. My generation also believes now that change won't come soon but rather it will come in the future, hopefully the next generations will see that change and appreciate all the sacrifices done to achieve it.